A June 16 cartoon in a daily newspaper showed how the youth of 1976 fought and died for freedom, while today's youth are being lost to alcohol and drugs. The cartoon used the world famous picture of student activist Mbuyisa Makhubu carrying the body of Hector Peterson, the first student to be shot and killed during the 1976 Soweto uprising. Peterson's sister, dressed in a full school uniform, was running alongside. On the other side, the cartoon shows the same picture, but this time the young man who was carried had passed out after drinking too much while a girl in a revealing dress and a cigarette walked next to him. The cartoon highlights the challenges today's youth are facing with alcohol and drug abuse. Recent research by the National Institute on Alcohol Abuse and Alcoholism showed that there was an increase in abuse of substances like alcohol and drugs among young people between the ages of 12 and 20. Following a number of drug and alcohol related incidents involving school children countrywide, police have been given permission to search learners at schools. Children and teenagers become involved with drugs for different reasons. Most of them see their friends and schoolmates using drugs and want to try it. Some do it to fit in with group of friends they admire - the so-called peer group pressure. Others have even seen their parents or role models doing. 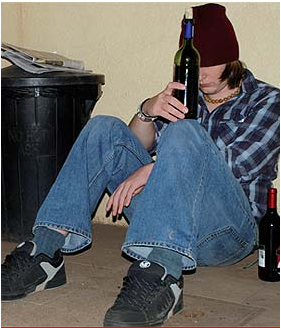 Young people also turn to drugs and alcohol when they cannot face the challenges of life. The first time you take drugs or drink alcohol, you probably experience a good feeling and become very confident. But Your body gets used to it and you become addicted. Addiction comes with a big price, because you have to keep feeding the habit. Drugs and alcohol are expensive. Many drug addicts turn to crime and other unacceptable behaviour like prostitution to get money. Many end up getting diseases like HIV and Aids, others end up in jail, while some die of drug overdoses or crime-related incidents. The more you know about how drugs and alcohol work and the negative effect they have on your body and mind, the more you will be able to protect yourself. To be on the safe side, do not even think of drugs and alcohol!